Very strong bag, the bottom has a pad to protect the bottom of bottles. Love our bags! They have really helps us create a successful marketing campaign! Strong divider and bottom pad secure the bottles safely, We haven't had any bottle breaks in my store since we started using there bags. The old bags (brown paper or plastic) we had several in the store and out of the store. A really great product you have here. We went with the double sided printing and it looks fantastic. Really great product you have here. We went with the double sided printing and it looks fantastic. These bags really help us stand out at trade shows! Very pleased with how our bags turned out! They are so durable. I can't believe something so small can carry four bottles of wine! The velcro closure on this bag is a really great feature. We are way ahead of the competition! I love how these bags are made COMPLETELY out of recycled materials! Plus they are a great addition to our marketing efforts. Absolutely wonderful! We added insulation and our clients couldn't be happier! Our flavored rums are packaged in the red color of this tote bag. The bag stands out in a crowd and our bottle design works well for the tote bags compartments. I work for a large discount liquor store and I suggested to my boss order some recycled reusable bottle totes and get rid of these horrible plastic and brown bags. He took me up on this suggestion and we found custom earth promos. Now my life as a cashier is just a little bit easier because packaging liquor bottles in these reusable totes, way better. I suggest this to any liquor retailer. 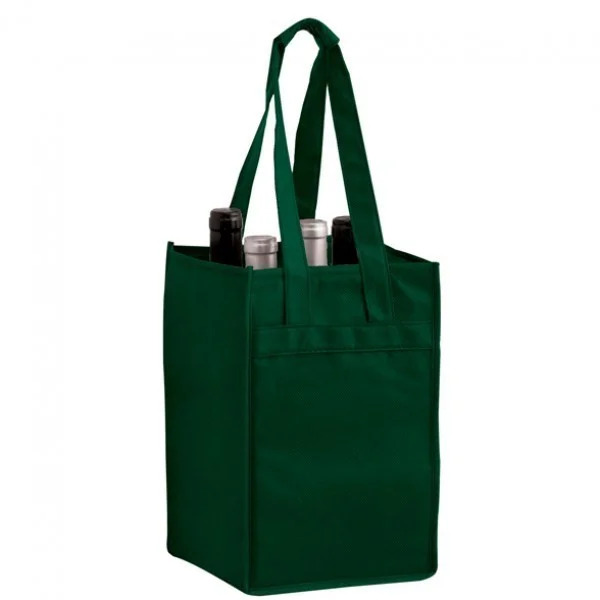 Great bulk order reusable wine bag. good construction and print. 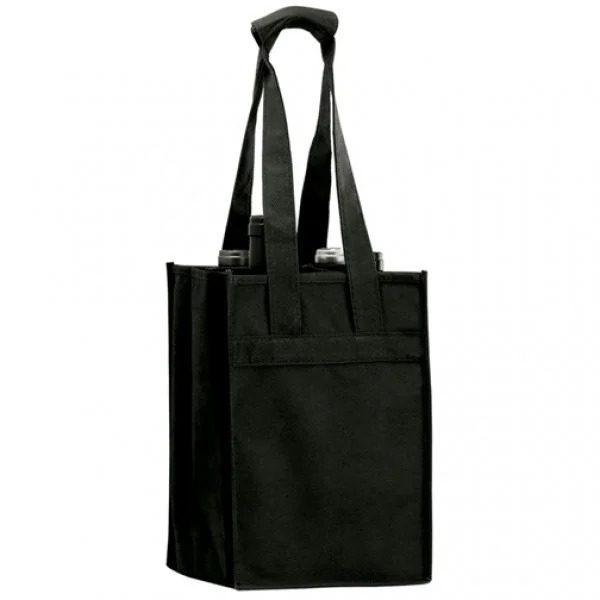 The velcro handle holder helps with the carrying of this tote bag. When you have four full bottles this comes in handy. handles are sturdy they have extra stitching and material where they connect to the bag. When myself and my customers use this I know the bottles are safe in the bag, each time they reuse it. I manage a grocery store and use several of CEP's recycled reusable bags. All of them are very useful and weather the use of weekly grocery runs well. We reorder from them all the time because we trust in there products. We were pleasantly surprised with the print quality, it does not look like a cheap bag. We packaged reusable bottles of water in these recycled reusable tote bags for a mission trip to give to residents of a poor village in africa. All recipients were so thankful for the water and the bags as well. I am still in the village helping out and I see residents reusing the bags and bottles all the time, it is truly an invaluable tool to them that allows them to transport water safely. I wanted to recognized custom earth promos for helping us save the planet and lives. We would recommend using this company, we are going to use them again for the same project just a different village. We strictly use this company's wine totes, we work for a large winery in northern California. The state enforces that you don't use brown paper any more so it was a natural switch for us and it has been a better switch as the bags last a lot longer and everyone sees them around. VERY NICE BAG, PRETTY GOOD CUSTOMER SERVICE. This bag was a great giveaway for us that promoted our new wine. All of the clients talked about the bag and how nice it was. I suggest this model wine tote. My Italian restaurant is BYOB so this reusable wine tote comes in handy big time. When customers come in they use it and when they leave the package the leftover bottles in there. It has been a great promotion for my restaurant being that we can not serve liquor. We customized this bag with color matching and we did identical prints on both sides. Both prints are consistent, high grade printing quality on all of our order. Very durable we use this for wine tours, customers love this wine tote bag. I purchased this reusable tote for my organic flavored olive oil company. We packaged sample bottles in this bag with our company logo printed on the tote. The bags came out great and we had a lot of event patrons purchase olive oil from us on this day. 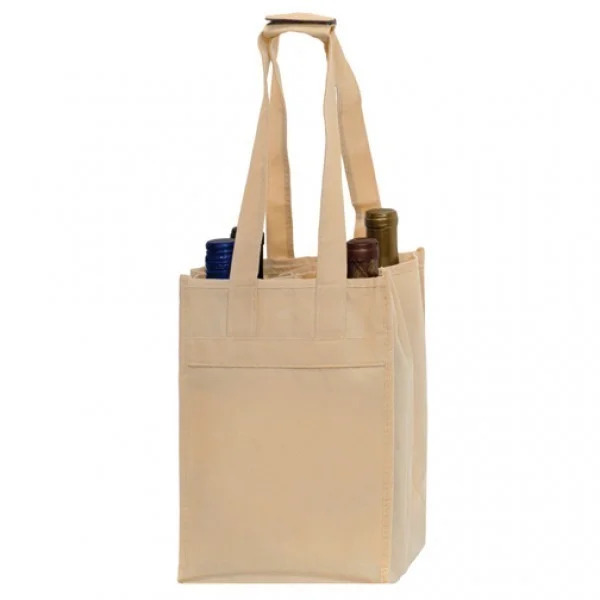 Perfect reusable bag for not just wine, I personally use it for organizing certain items when I go to the grocery store that fit well in the bag. My customers do the same I have noticed. A Lot of color options, I decided to go with the red and blue options because I thought they stood out the most. We worked for 1 week with the graphic design department at custom earth to come up with a creative logo for our reusable wine totes. We received the totes today and they look great, just as we designed. Especially popular with hospitality businesses—restaurants, hotels, resorts, wineries and bars—and those in other industries, our Reusable Wholesale 4-Bottle Wine Totes can be tailored to your very specific design requirements. You can promote your brand with customized imprints of brand names, logos and catchy slogans, or whatever else suits your marketing campaign. And because these bags are recyclable, you are instantly establishing your eco-friendly brand image, which is an increasingly important factor in the purchasing decisions of today’s customers. 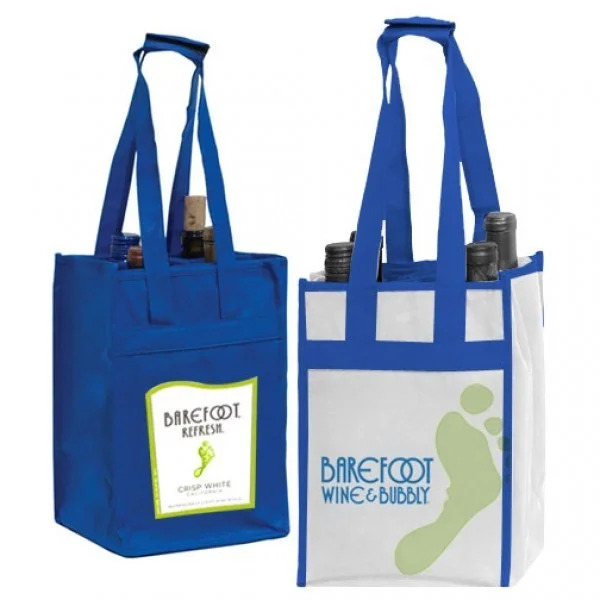 Our latest collection of Reusable Wholesale 4-Bottle Wine Totes is a creative and popular marketing vehicle to successfully promote your business. At 7" W x 11" H x 7” D, these large bags are completely made from recycled materials. 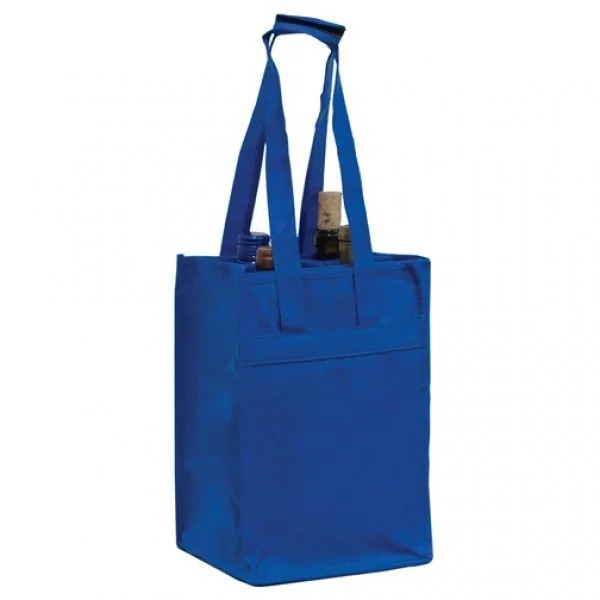 Reusable and recyclable, they provide plenty of real estate to prominently display your custom logo and message, so you stay in the spotlight everywhere your customers take these bags. Because they’re so quick and easy to use, people carry a whole lot of different items in these multipurpose totes and take them to such a wide range of places. So you can expect a ton of unexpected extra brand exposure you might not get with other promotional products. Reusable Wholesale 4-Bottle Wine Totes from Custom Earth Promos are designed with protective built-in bottle dividers, as well as a reinforced plastic bottom board for extra protection and support. They also feature helpful 20-inch handles for more comfortable carrying, and a Velcro closure on top to keep the bag closed and its contents secure. Available in seven eye-catching colors—Black, Red, Royal Blue, Tan, Burgundy, Hunter Green & Navy— these bags are also exceptionally easy to customize. Select a color that matches your brand logo color scheme, or mix and match between two or more of your favorite shades. If you’re not satisfied with one of the default imprint designs we have in stock, our design team will work with you to create a unique imprint design for your bags. And you can really boost your brand by adding a distinctive custom message or a catchy slogan. For instance, we can imprint some messaging about your dedication to protecting the environment, which is likely to appeal to the huge number of eco-conscious consumers just waiting to discover your brand. And you can be sure to mention that all of our products have been carefully tested to make sure they are free of harmful chemicals and pollutants, in full compliance with California Proposition 65 guidelines. At Custom Earth Promos, we understand your real need to differentiate your business and stand out from the pack. That's why we want you to have full input as collaborate to build your Reusable Wholesale 4-Bottle Wine Totes from scratch. We offer all the important features and services you demand, such as matching fabric color and logo, end-to-end printing, extra pockets, added insulation, and more. When you order direct from our overseas manufacturing facility, our expert design team can handle any further customization work you require. They can attach a custom color handle, adjust dimensions, increase material density and much more. In just 8 to 12 weeks, we can deliver your fully customized totes according to all of your design and brand preferences.